So, What Can I Eat Now?! is a healthy cookbook that contains tasty recipes that are 100% dairy-free, soy-free, egg-free, gluten (wheat)-free and artificial ingredients-free. Also, the recipes are low in sodium, sugar, fat, and calories, which are all important for people challenged with diabetes, high cholesterol and high blood pressure. 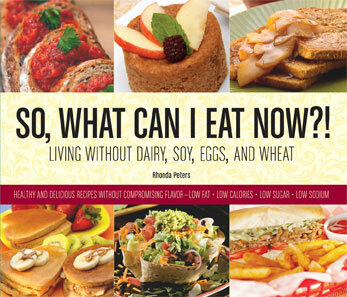 Rhonda Peters, the author, was inspired to write So, What Can I Eat Now?! for two reasons: first, she wanted to inspire and teach people how to cook healthier; and second, she discovered that she had multiple food allergies and food intolerances, in addition to other health concerns including Thyroid Disease and Rheumatoid Arthritis. Currently, books can be purchased for only $14.99 online at the following: Rhonda’s Cooking website, and Amazon.com. Also, in the Phoenix area, you can purchase the book at Changing Hands Bookstore (Tempe, Arizona), Healthy Habit Health Foods Store (Phoenix, AZ), The Gluten-free Country Store (Gilbert, Arizona), and Dr. Jennifer Calvo Naturopathic Care (Anthem, Arizona). Congratulations, Rhonda! It’s been a long time coming. Your dream is now a reality. I pray much success for you and may the Lord exceed your wildest dreams and expectations! Thank you so much, Kendra! I appreciate the kind words of wisdom and prayers!! Congratulations! I love the look of the book and the title is super catchy! Did you prepare the dishes that were featured on the cover? Thanks so much for the feedback! I’m so glad that you like it! Yes, I prepared every dish that’s in this cookbook. The recipes for the cover pictures are in the cookbook. Hi Rhonda! Met you on Twitter. I am a fellow natural food advocate and book author. Congrats on the new cookbook. Recipes look delish!!!! Hi, Tonya! Thanks so much for the kudos and feedback! I look forward to us staying in touch for sure! Thanks so much!! I really appreciate the feedback. Yes….3 long years love! LOL! Rhonda is like a dream come true. Ever since meeting her about a year ago she’s been a wealth of ideas and suggestions for “What can I feed my son?” challenges in our family (He’s on a GFCF diet) and other assorted often-ridiculous questions. If you have ANY type of dietary restrictions (and frankly, even if you don’t) you should buy this book. If the photos don’t make you salivate then you’ll have to wait for the braille edition. The recipes are amazing and tasty. The fact that they are incredibly healthy and also wheat/soy/dairy/egg free is just a bonus. Make someone’s holiday: Buy a copy as a gift. The book doesn’t disappoint. Ahh, Jim thanks for the kind words! I love what I do to help others with eating healthy and eating special diets! Thanks for allowing me to help! Hi, thanks for your interest. When you get to the Paypal website, there are two choices that you must make after you select the quantity of books on the left side. on the right side, underneath “Choose your way to pay” you can sign in with a Paypal account, or click the link to pay with a credit/debit card without signing into a paypal acct. Let me know if you’d me interested in doing a book signing in the store in late April/May. Hi, Lynn! Thanks for the speedy reply! I’m definitely interested in a future book signing. However, I’m in town on April 9th at Hue-Man Bookstore (8th Avenue, New York, NY) for a book signing. I looked at your location on the website and you are a few minutes away from there. I would love to meet you and chat and give you a copy of the book! Maybe you can come to the signing on April 9th or call you and meet at your place. I will be in town from April 7th – 10th. I hope we can connect! My name is Grant. I saw you on Twitter. I am with an exciting new company called SnackHealthy. We are excited and looking for people to join our team and movement. Would you be interested in checking out my website? Get FREE healthy snacks for you and your family! Thanks so much for the comment and your interest in me. I will check out your website for sure! Hi Rhonda First and foremost congratulations on all your success. I am a Nutrition and Dietetics student at ASU I am hoping to interview you for a career project For my nutrition in the media course.I was wondering if that seemed like something you would be interested in? Hi, Safia, thank you so much; I appreciate the kind words. Yes, I can support your request. We just have to find a good time to do the interview.